An Australian LGBT center currently in development has added black and brown stripes to their pride flag to be inclusive of indigenous peoples. The Victorian Pride Centre in Melbourne hasn’t been completed yet. The center was funded by the Victorian state government with a grant of $15,000,000. It is being built in, St Kilda, a suburb of the city. 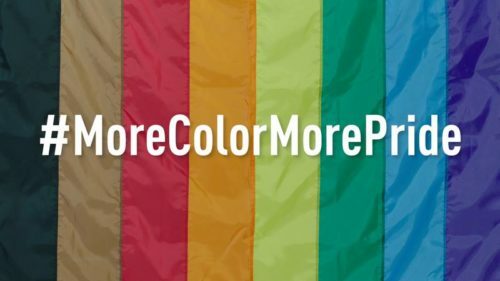 While the original plan for the building’s logo used the traditional rainbow pride flag, the group’s board was inspired by Philadelphia’s updated and more inclusive flag meant to honor and integrate non-white communities into the rainbow of LGBT people. While the updated flag received considerable backlash in the States, the center reports that hasn’t been the case down under; most of the feedback they have received has been positive. “In changing the logo, the Board had three thoughts,” said board member Margaret Hansford. “First, the LGBTI community has been a major beneficiary of increasing public support for diversity and inclusion. We need to be leaders in continuing to identify and welcome groups who feel, or are in fact, excluded from our community. “Second, Aboriginal and Torres Strait Islander LGBTI people have helped, in no small measure and by their personal and political examples, to build the community and the organisations we have today; and long may they continue to do so. They face severe and ongoing discrimination and oppression and we want our ‘welcome mat’ to have a specific ‘hello’ for them,” she said.